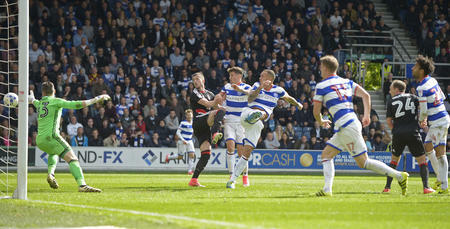 QPR came back from a goal down, and a man down, to secure a share of the spoils at the City Ground. After Karl Henry was sent off for his second bookable offence in the 34th minute, Britt Assombalonga gave Nottingham Forest the lead on 38 minutes. Having dominated much of the first half, it was hard to see how QPR would get themselves back into this game, but that is precisely what they did after the interval. Despite the numerical disadvantage, Rangers laid siege on the Forest goal, and their task was aided on 71 minutes when Hildeberto Pereira was dismissed for his second yellow card of the afternoon. And just when it seemed QPR’s bid to take something from this match was running out of time, substitute Idrissa Sylla headed home fellow sub Nasser El Khayati’s cross to equalise with just five minutes remaining. Jimmy Floyd Hasselbaink made four changes from the side that lost to Brentford. Steven Caulker, Massimo Luongo, Ariel Borysiuk and Idrissa Sylla were replaced by Grant Hall, Karl Henry, Pawel Wszolek and Sebastian Polter. Caulker and Luongo missed out owing to knocks, while Borysiuk was not involved due to an emergency family issue. It meant the R’s lined up with Alex Smithies between the sticks behind a back four of, from left to right, Jack Robinson, Hall, Nedum Onuoha and James Perch. Conor Washington started on the left of midfield with Wszolek on the right. Jordan Cousins was joined by Henry in the centre of the park, with Tjaronn Chery playing off Polter in attack. Both sides went into this game looking to get back on track after their respective disappointments. The hosts hadn’t won in their previous three fixtures, having won only one of their last 11 games, while the R’s had suffered back-to-back defeats. Robinson showed he has no mental scars over his recent injury problems with a full-blooded, but fair, challenge on Hildeberto Pereira in the second minute of the game, as the R’s looked to settle quickly at the City Ground. Forest thought they had taken the lead in the tenth minute when Britt Assombalonga converted Pereira’s low centre beyond Smithies, only for the effort to be ruled out for offside. It was an early warning for the R’s, and moments later Pereira was at it again, teeing up Pajtim Kasami for a shot from the edge of the area, which Cousins did brilliantly to block. Both sides were struggling to create any real chances of note in the opening exchanges, but Ben Osborn saw his shot from 25 yards comfortably gathered by Smithies in the 23rd minute. Moments later, Assombalonga had a great chance to give Forest the lead when a long clearance from an R’s attack put him clean through on Smithies. The QPR keeper stood tall, and brilliantly denied the Forest number nine, saving to his right. At the other end, Chery saw his shot from distance clear the crossbar in the 33rd minute. 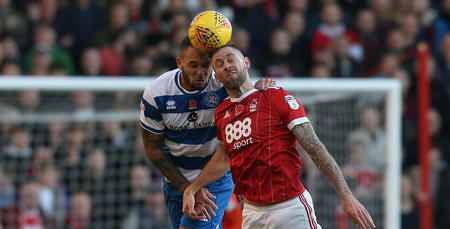 Seconds later QPR’s job was made all-the-more difficult when Henry was sent off for his second bookable offence, bringing down Henri Lansbury as he progressed towards the edge of the R’s penalty box. Hasselbaink dropped Chery into centre midfield, moving to a 4-4-1 formation, but it took the hosts little time to make the numerical advantage count, taking the lead in the 38th minute through Assombalonga. The Forest forward broke clear of the R’s defence before rounding Smithies. From a tight angle, he managed to successfully find the back of the net, despite Hall’s best attempts to deny him on the line. Just before the break, Osborn went close to doubling the hosts’ advantage but his drive from 15 yards flashed over the crossbar. After the re-start, Forest were on the front-foot, with Osborn getting behind the R’s defence before his low centre was cleared by Hall, while Lansbury’s shot from 20 yards moments after deflected just wide. As the R’s tried to find their way back into this game, Hasselbaink made his first change of the afternoon, bringing Olamide Shodipo on for Wszolek. Just before the hour mark, Washington’s effort from 25 yards stung the palms of Vladimir Stojkovic in the Forest goal, as the Northern Ireland international cut in from the left. Chery was next to test the home stopper, his long-range drive being pushed to the right following a period of pressure from the R’s as they fought to take something from this game. Robinson then won a free-kick down the left following excellent individual work, which Chery looped into the box. In a packed penalty area, the ball just wouldn’t fall to a Rangers man as Forest were able to hack the ball away. On 70 minutes, Shodipo then went close. Washington made great ground down the left before squaring for the QPR youth product, whose effort from 18 yards fizzed just over the bar. Just 60 seconds later, Forest found themselves down to ten men when Pereira picked up his second booking of the afternoon for a trip on Washington. With the R’s having worked their way into the ascendancy, suddenly there was a real sense of hope amongst the travelling QPR supporters. On 75 minutes, Hall’s header at the far post from Chery’s corner went just wide. The centre-back held his head in his hands, knowing it was a great opportunity to find the leveller. The pressure on the Forest goal had now become relentless, with the R’s winning a series of free-kicks in and around the hosts’ penalty box. With just under 15 minutes remaining, Washington was replaced by Idrissa Sylla, with Hasselbaink evidently keen to add to the aerial threat in the Forest box. At the other end of the pitch, Onuoha made a stunning goal-line clearance to prevent Assombalonga from netting his second of the afternoon, while Forest sub Thomas Lam almost found the top corner seconds later with a fine effort from distance. With little under ten minutes remaining, Hasselbaink made his final change of the afternoon, replacing Robinson with Nasser El Khayati. And his first involvement in the game was to cross for Sylla to head home in the 85th minute! The former Burton man twisted to create space on the right before delivering to the near post, which Sylla duly converted into the corner of the goal to the absolute delight of the R’s fans behind the goal. Having played for an hour with ten men, Rangers showed little sign of fatigue as they pushed for an unlikely winner. 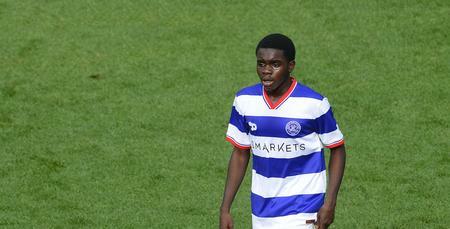 Polter squared for Sylla in the box, but the Guinean was unable to control the ball before the chance was gone. “Come on you R’s” sang the travelling fans who sensed a first win at the City Ground might suddenly be on the cards. During seven minutes of added time, Kasami went down in the R’s penalty box but his appeals for a spot-kick were waved away by referee Kevin Stroud, to the huge frustration of the Forest bench. In truth, the hosts looked more likely to score in the final minutes, but Rangers held out for a truly hard-fought share of the spoils. 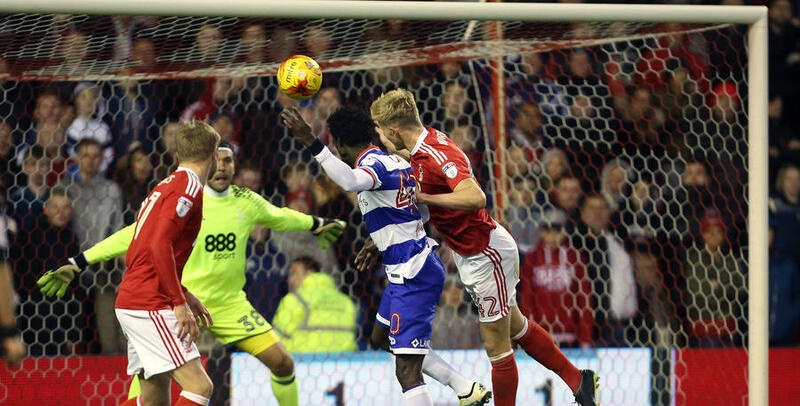 QPR travelled to Nottingham Forest's City Ground looking to record their first ever win.